Dublin city centre is fairly compact and many of the sights and attractions are easily reached on foot. But if you would like to use transport to see Dublin city then there are many options for transport in Dublin available including Bus, Taxi, DART (Rapid Rail), Train, Luas (Dublin’s Tram) and Car. The two options which are the cheapest are walking and cycling. Walking is one option where you will see attractions up close and you can find unique places where you wouldn’t find if you were using a bus or train for example. A good map of central Dublin can be got from the reception of most hotel or from any Tourist Information Office. Maps and other useful information can be found at Discover Ireland Centre, Suffolk Street, Dublin 2 (just off Grafton Street), Discover Ireland Centre, O’Connell Street, Dublin 1, Discover Ireland Centre, Terminal 1, Dublin Airport and Discover Ireland Centre, Terminal 2, Dublin Airport. A new initiative is The Dublin City Visitor Assistants who walk the city’s streets daily to welcome visitors and provide information on events, directions, transport etc. There are quite a few companies providing walking tours of Dublin taking in areas such as Temple Bar, The River Liffey, Castles, Cathedrals, Viking and Medieval Dublin, Joyce’s Dublin etc. 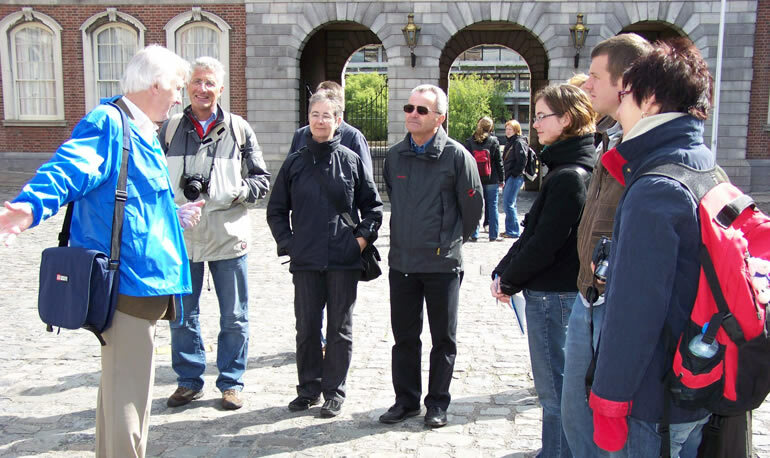 Pat Liddy’s Walking Tours of Dublin is one of the more established ones.. 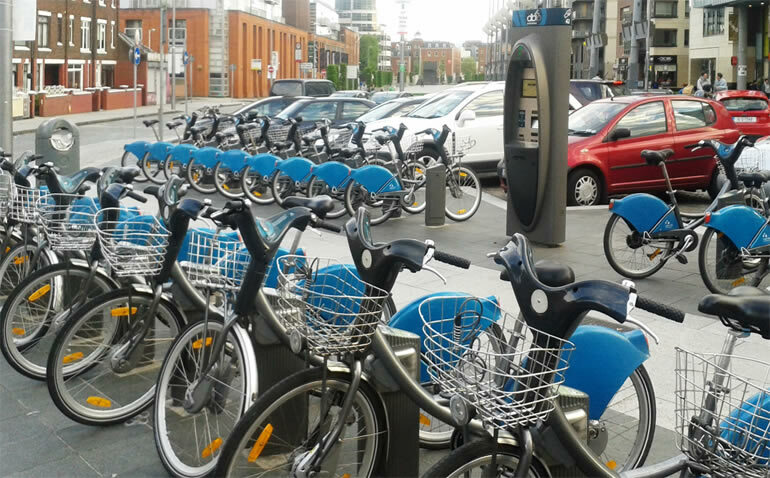 If you enjoy cycling then you will be in your element in Dublin because a new Public Bike System has been put in place in the city where there are stations located all over the city where you can hire these bikes. Cycling is a great fast way to get around the city and they have supplied 42 stations so you have no problem finding a bike to hire. The best thing about this new bike system is that you can hire a bike at great prices that won’t break your budget. At the time of writing there are 102 stations around the city where you can collect or deposit a bike. For full details including joining the scheme visit www.dublinbikes.ie. If you prefer not to walk or cycle then Taxis are a good option in Dublin. 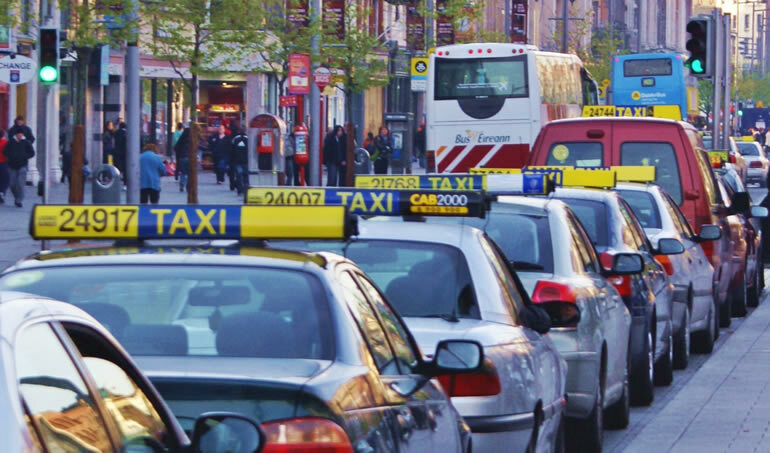 You will have no problem finding a Taxi as there are many Taxi stands located around Dublin. Taxi ranks are located at O’Connell Street, St. Stephen’s Green and Dame Street and that’s just to name a few. If you are staying in a Dublin Hotel then you can ask them to call a taxi for you which is also a good option. Because they are allowed to use Bus Lanes, taxis are a very good option for avoiding the gridlock of rush hour traffic. Taxis are also a good option for visitors travelling late at night when there is limited or no bus and tram services available. They are safe and fast and are not too expensive. Buses are pretty cheap to use and there are Ticket Agents located around Dublin provided by Dublin Bus to help locals and tourists with their travel plans. Here you will find timetables where you can plan your bus journeys to different locations and also prepaid tickets can be purchased to make your bus journeys even easier. Dublin Bus provides many services including Airport Services, sightseeing tours, Xpresso, Nitelink and many more to choose from. Dublin Bus website has quite a good Route Planner to help travellers to locate the right bus terminal. There are a few companies providing hop-on hop tours (some on open-top buses) to many of Dublins famous landmarks. These generally have a guide and audio commentary. The DART is Dublin’s rapid train service and it runs along the coast from Howth in north County Dublin through the city centre and southwards as far as Greystones, Co Wicklow with numerous stations along the route. DART services run every 15 minutes and this is a quick and easy way to get around the city. The Luas is Dublin’s tram system and its newest form of public transport. The system is being expanded with some new lines an many more stops to be opened in the near future. As of yet Dublin has no underground system although plans for a Metro were developed but shelved after the recession hit.